The state park rents a few kayaks, by the hour – or bring your own. As this is a state park, there is a parking fee. $5.00 daily or I suggest you purchase an annual pass. Friday, Apr. 15, 2011 – Ohoopee River near Reidsville, Ga. – Duration 4-1/2 hrs. – Approx 5 miles from Hwy. 280 bridge to Joy Bluff Landing below Hwy. 56 – 1 mph current. 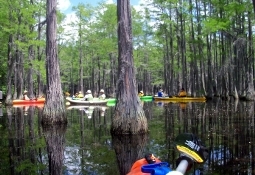 You will be paddling your canoe or kayaks in, black water covering a sandy bott om, lowland swamp forest, a mixture of high bluffs and numerous white sand dunes ideal for picnicking, navigate around an old grist mill dam with rocky outcrops below the dam and a short float thru swifter current. Saturday, Apr. 16, 2011 – Ogeechee River near Millen, Ga – Duration 6-1/2 hrs. – Approx 11 miles from the Bull Hole near Herndon to Hwy. 25 bridge near Millen, Ga – 2 mph current, lowland swamp dotted with ancient cypress and abundant wildlife – halfway stop for lunch break at Bennett’s Landing. Sunday, Apr. 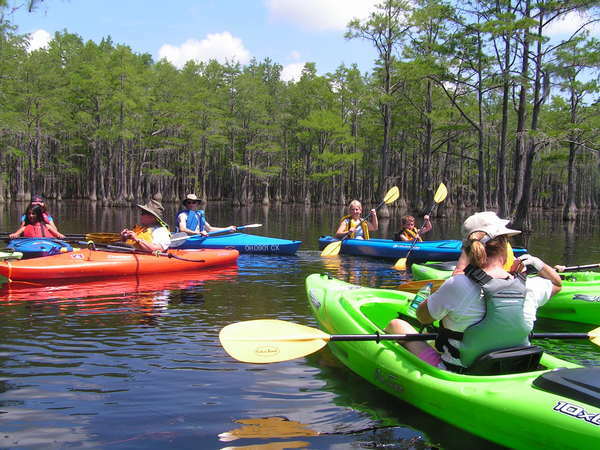 17, 2011 – George L. Smith State Park near Twin City, Ga – Duration 2-1/2 to 4 hours – calm blackwater trails thru a 412-acre mill pond – heron/egret rookery, beaver lodge, osprey nest, many types of waterfowl, fields of water lilies, covered bridge/grist mill built in 1880 – travelers who need to depart early will have an opportunity to cut their tour short if necessary. 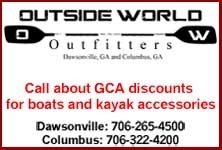 Millpond Outfitters has five tandem kayaks and nine single kayaks available for rent, along with paddles and vests. Rent them for a daily rate of $25 for singles or $35 for tandems (cash or check only, no credit or debit cards please). Due to limited availability, reservations would be advised. Please email me directly, if you plan to attend mail4marieshort@bellsouth.net or call 404-202-9546 and leave a message.